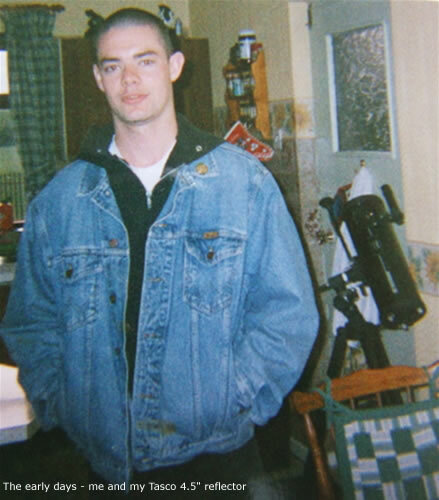 DOB: 18/02/1978, Home: Maghera, N. Ireland. The following is a brief summary of how I became interested in astronomy. It's difficult for me to ascertain the exact time when I became interested in astronomy however it probably entered my life well over ten years ago, perhaps in the year 1995. At this time I was still at school and had an unhealthy obsession with Paleontology. I was always fascinated by ancient life on Earth and the literature introduced me to the idea of mass extinctions on our planet caused by catastrophic impacts from outer space. This was the first time I touched astronomy and my interest gradually intensified with time. I did not have the slightest clue about the night sky and I have to confess that my astro knowledge was very poor. However during the Summer months I would often stretch out on a lounger at all hours of the night watching satellites and meteors zip through the sky. I can trace a single point back in time that marked the beginning of my observing life, during a very cold frosty night in December I recall standing on top of the large oil tank located behind my house. I was watching the sky intensely but I had no idea why I was doing it, then it hit me - I decided then and there that I wanted to know the entire night sky entirely by heart - in fact, I recall thinking that I wanted to know the sky so well that if a faint star suddenly appeared in the sky then I would be able to detect it immediately! It was this decision that most likely changed the course of my life. That night I promised myself that I would visit my local library the following day and acquire the information I needed to begin my journey among the stars. While browsing through the astronomy section of my local library I found a book that seemed perfect for me, although I cannot recall the title it was one of those pocket field guides that covered many areas of visual observing. I read this book over and over and finally settled on the constellation section that showed white star patterns on a dark background. On the next clear night using this book I had found my first constellation - Ursa Major then from there I put to memory Ursa Minor with Polaris then progressed from these into Draco. WOW, I had just learned three entire constellations in one go! This gave me a tremendous feeling of satisfaction and I vowed that I would learn a new constellation every night. Within a short period of time I had learned much of the northern hemisphere night sky and better yet these figures stayed in my mind. It was then that I realized that I was very efficient with star pattern recognition. Now all I needed was a telescope. My yearning for a telescope was very strong and it was fortunate that I had developed this desire on the months leading up to Christmas. I remember dropping a lot of subtle hints to my parents during that period and I honestly didn't think that they had taken my hints very seriously until 6am on Christmas morning when I found a long rectangular box wrapped in bright Christmas paper protruding from behind the curtains. I tore the paper off frantically which revealed my very first telescope. I was delighted with my gift and immediately set it up on the living room floor. It was a 2.5" refractor with a gleaming white tube with a small finder scope and alt - azimuth mount on a light wooden tripod. Today this kind of telescope would be frowned upon as it had a wobbly mount and was made of cheap glass but for me it was the best telescope in the world. I set up my 2" refractor on the crunchy frozen grass. It was a bright night due to strong moonlight reflecting off the white frosty garden and rooftops. Naturally my first target was the Moon itself. Although my low power eyepiece afforded me a very narrow view I did get my first look at the lunar terminator which completely blew me away - I could actually see craters on another world from my own back garden. Then I turned my little 'spy glass' on the brightest star in the sky called Sirius which looked like a colourful, almost dazzling, gem followed by my 'discovery' pf planet Jupiter. This was the first time my eyes had starred at another planet and I'm sure I felt the same emotions as Galileo himself did when he spotted Jupiter's four bright moons over four hundred years earlier - I was hooked! Learning my first constellations and getting my first telescope were important events for me however they fail in significance to one event in Jan/Feb 1997. During a drive under the pitch black crystal clear skies in the Slaughtnail area outside Maghera my friend and I stopped the car and stepped out into the chilly night air to admire the stars which were truly breathtaking from this location. It was before dawn and the atmosphere was completely silent and slightly spooky. We glanced to the eastern sky and got an incredible shock - hanging in the sky was a glorious alien sight. After some time we realized we were looking at great comet Hale-Bopp complete with brilliant fan shaped dust tail. This visitor left us speechless and I cannot convey to this day the emotions I felt as I stood there completely astounded by what I saw. This was my first sighting of a comet and it affected me deeply. It was this one event that would later fuel my obsession for comets, a passion that will stay with me for the rest of my life. The comet became a friend and I seen it every clear night during its apparition as it grabbed news headlines around the world. A vivid memory was a chilling Thursday evening. I was seated on the back seat of a car traveling from the north of Ireland to the south, a long drive by any means but a lonely one as I was going to fight in a boxing tournament to represent my local boxing club. I was full of anxiety and adrenaline which accompanies the sport however outside my rear window under the dark skies of the barren country side I could see Hale-Bopp with its dazzling tail. The comet seemed to accompany me throughout my journey and I watched it set behind the dark outline of the surrounding mountains. It's a memory that I have never forgotten and which seemed to be important to me in some strange way. In the weeks ahead the comet disappeared from our skies - but my interest in comets didn't. While attending college in Coleraine I started purchasing every astronomy magazine I could get my hands on to further my quest. I felt ready for a new telescope and I immediately started saving every penny I had. 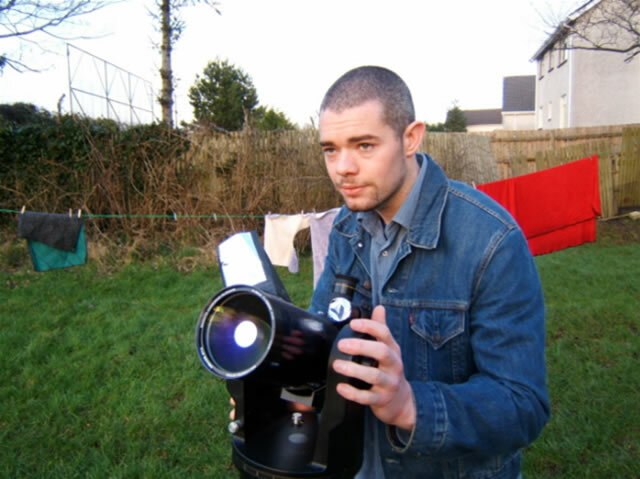 I stumbled across a small telescope shop in Coleraine and found a nice reflector. It was bought, however I was not to see starlight through it until Christmas morning again. My new telescope was a black Tasco 4.5" short tube reflector (FL=500mm) with wooden tripod, two poor quality eyepieces, and motorized focuser all on an equatorial mount with slow motion manual controls. It took me hours to figure out how to set up the mount but I soon mastered it. With this scope I began a 'serious' Jupiter moon observation programme were I would stay up the entire night until pre dawn waiting for Jupiter to rise in the eastern sky when I then sketched the positions of the Jovian satellites. I done this every single night without fail with the aim of working out the Moon's orbital period. I found this to be a real fun project and the process got me used to late nights and that special time before dawn that would later be so important for comet hunting. I just kept adding more and more sketches to my collection until they literally were covering my desk and eventually my room. The Tasco was the first instrument I used to observe deep sky objects. M13 and M31 made an ever lasting impression on me while the galaxy pair M81 and M82 astounded me. These two remain my favourite galaxies today. I was well and truly hooked on astronomy by now and my new telescope was pushed to the limits with my Jupiter programme, however it was not long before I bought a third telescope. I ordered a Meade 90mm ETX RA and began more extensive observations of the Moon, Jupiter, Saturn and Mars - a process that taught me about patience and concentrated averted vision. After some time I realized that I needed a larger telescope if I wanted to get into more serious observation. On May 4th 1999 I made my very first sunspot observation at the end of a hot sunny day. I was amazed by what I saw and from then on I decided to start a sunspot observation programme were I would monitor the Sun each clear day counting spots/pores, commenting on the Umbra, Penumbra, and faculae details combined with a disk sketch. 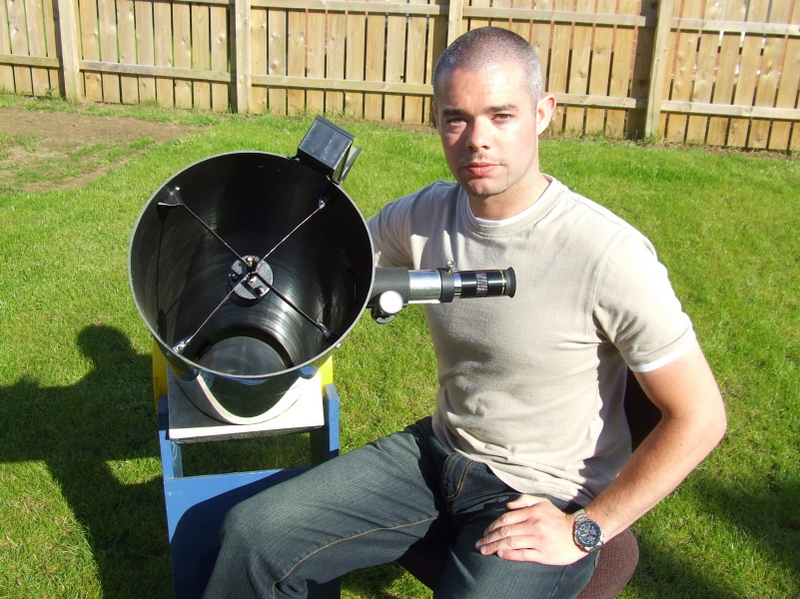 As mentioned above I bought a Meade 90mm ETX RA M.Cass telescope and constructed a cardboard device on the optical tube assembly so I could project the Sun's disk onto a sheet of card for safe observation. I later upgraded to a Baader astro solar filter and continue to observe the Sun most days with my particular interest focused on naked eye sunspots however I hope to one day see a solar flare in white light- a rare sight! The ETX remains my primary instrument for solar observation however I also use it for casual Moon and planet work. I wanted aperture so keeping my price range in mind I spent hours reading through a Meade catalogue and decided that I would save up enough money to purchase the companies 8" LX10 Deluxe F/10 S.Cass. To help pay for the scope I had to sell my first two telescopes which is something I have always regretted. After what seemed a long wait my scope arrived in late November 1999 just as a Nova erupted in the constellation of Aquila! My Moon and planet programme continued with renewed fever but I soon felt ready to dive head first into the deep sky. I bought a copy of 'The Messier Objects' by Stephen James O' Meara which prompted me to begin a Messier observation programme which I started immediately under dark skies and even under a full moon. Distant galaxies quickly became my favourite telescopic targets and I spent ALOT of time studying their delicate forms every single night. After some time I became restless, I wanted to try something different, challenging, and perhaps make a contribution to science, I did not know what it was but I wanted a project I could commit to on a nightly basis that would keep my busy for years. Yet again it was a book that gave me the answer. I had been reading 'The Sky - A Users Guide' by David H. Levy and had just arrived on the chapter dealing with comet hunting. David's introduction where he described his New Year's comet discovery and the process of visual comet hunting changed my path in astronomy for ever! I realized with 100% certainty that this was what I wanted to do. My earlier Hale-Bopp sighting came to mind so this almost felt like a calling. I ordered a dew shield, telrad, and F/6.3 focal reducer and began my own comet hunting programme on May 1st 2000. Since that date I have been searching for comets every clear moonless night and even occasionally under strong moonlight. 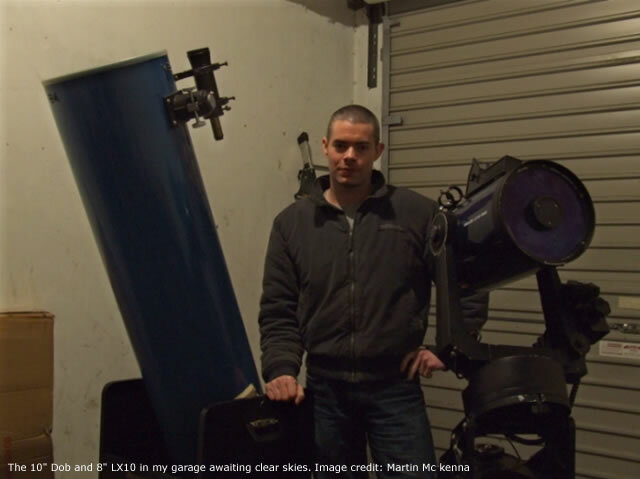 I spent 500 hours sweeping the sky with this telescope but I decided that I wanted to upgrade to a larger instrument. I saved every penny I could get my hands on and ordered a Meade 16" F/4.5 dobsonian reflector from 'Telescope House' in mainland UK. While I was in the spending mood I also ordered a Meade 32mm series 4000 32mm Super Wide Angle 2" eyepiece, telrad, 8X50 view finder, and JMI NGC Micro Max digital setting circle unit. Due to stock problems I had to wait for approximately four months before my new telescope arrived in two delivery vans. I spent that exciting sunny day in the garage assembling the scope as I had to build the rocker box and install the primary and secondary mirror. That night was was clear and I some how managed to carry the scope down to my back garden in two sections nearly breaking my back in the process. 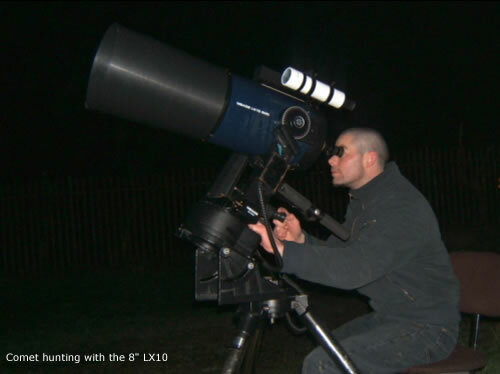 It was then that I realized that I could not do this every night, so not having an observatory I placed the scope at a strategic position in the back garden which would give me good angles on various compass points for comet hunting. I covered the scope in a heavy water proof cover secured by bricks so now the scope was there for me any night when I could have it pointing skyward within one minute, in fact I think my record was 20 seconds! The 16" became my primary comet hunting tool but I also used the 8" to sweep the sky sectors that the 16" could not get to. I knew I had made a great decision purchasing the 16" which became apparent on the very first night. I could see much fainter galaxies and comets combined with a crisp high contrast 1 degree field of view (2 full moon diameters) so I felt sure that my chances of success had increased dramatically. 'First light' was comet T7 LINEAR which I found easily. In the years since then I have used five telescopes to search for comets..
My comet hunting programme remains very active to this day. I live in the outskirts of Maghera, N. Ireland where the sky can be excellent. There is mild light pollution in the south above the town but with this exception the sky is very dark. Going by the forecast and weather reports from other observers at different locations I have come to realize that I get a fairly large number of clear nights. I'm lucky in a sense as the new housing estate I have moved into has no street lights yet and within a ten minute walk I can be in the town or country. On a typical moonless night the transparency = 8/10. This means I can see stars to magnitude 6.5 with the naked eye with M31 and M33 being easy targets. In fact M31 can be detected without optical aid even under a full Moon! Occasionally we get an exceptional clear night after a heavy shower or cold front has passed over when the transparency reaches 9 - 10/10. When this happens the night sky is simply stunning with the Milky Way in the form of a glowing cloud from horizon to horizon complete with dark complex dust lanes dividing the Milky Way into two glowing streamers as it enters Aquila and Ophiuchus. Regularly I can see stars to mag 7.0 (which normally requires binoculars) with a jet black sky background. As a testament to these skies I have seen the galaxy Messier 81 without optical aid on two occasions and have made a number of observations of the elusive Zodiacal light, Zodiacal band, and the infamous counter glow - the Gegenschein. Although I occasionally travel to other locations I have yet to see a sky of such high quality as the one over Maghera and hence I'm very proud of this location which has yet to be beaten. I have spent the vast majority of my observing career on my own however several years ago I joined a local astronomical society. The club was a great opportunity for me to meet other observers with similar interests. Now we hold numerous observing nights when a large group of people meet at a pre determined location to spend entire nights watching meteor showers, Messier marathons etc which offered me the chance to gain new knowledge and use many kinds of telescopes. Each month a guest speaker gives a lecture at the club, many of whom hold imminent positions in professional astronomy. This gave me the chance I never had before to built upon my knowledge and gain many new friends and contacts. If you have never joined an astronomical society then I urge you to do so now. You wont regret it! 1) I routinely monitor a selection of my favourite variable stars on a nightly basis and have begun a Nova search visually with the naked eye down to mag 6.0 backed by a photographic search down to mag 7.0 along the Milky Way using my digital camera. 2) Day time and nocturnal Atmospheric phenomena such as Crepuscular rays, Sun Haloes, Sundogs, parhelic circles, upper/tangent arc's, circumzenithal arc's, Sun Pillars, Rainbows etc combined with unusual cloud formations such as Virga, Mammatus and Lenticular displays. I also like imaging Sunsets. Recently I have become very passionate about observing Funnel Clouds, lightning and Tornadoes after several sightings in July 2007. Check out my Storm Chasing Reports. 3) Deep Sky objects - most of which I have encountered while comet hunting. 5) Solar observing - I observe all large sunspot groups that appear on the Sun's disk and keep a record of all sunspots that reach naked eye visibility. 6) Comet Observation / Comet Hunting - I observe all the comets that come within range of my telescopes and search for new comets on a regular basis using three different telescopes. To date I have observed 67 known comets and have spent over 1000 Hours hunting for new comets. I also enjoy Sketching comets. 7) Photography - I'm a very keen photographer and astrophotographer although my equipment is rather basic at the moment however an upgrade to the collection is planned soon. My primary photography passion is convective weather events and thunderstorms which provide me with my greatest thrills. 8) Meteor Showers/Fireballs - I observe all the major annual meteor showers either on my own or with a friend. To date the highest count I have gathered was during the Perseid meteor shower in August 2015 when I saw 477 meteors. - I have yet to beat this personal Record. 9) Aurora - I'm a very big fan of the Aurora Borealis and monitor the northern sky for these beautiful displays every single night using visual observations and online charts from the internet to determine the possibilities of a display and if an aurora watch is warranted. To date I have seen 145 aurora displays. 10) Comet / Asteroid Impact Threat - To compliment my visual comet hunting programme I'm currently researching the impact hazard which has been in progress for several years. This fascinating and important area of astronomy blends with other branches of science such as Geology, Paleontology, Statistics, Mathematics and computer modeling. I might delve into this area on nightskyhunter at a later date. 11) I also periodically search for Sungrazing comets using the near real time C2 and C3 data from the orbiting SOHO spacecraft and have independently found 22 Kreutz comets. 12) I'm a very passionate Noctilucent Cloud observer which I specialize in intensely from May to August each year. I record all of the above observations in my Observing Log books. 13) I'm also a very passionate drone pilot since 2016, I get immense satisfaction from obtaining aerial footage of landscapes, coast lines, storms and snowscapes. 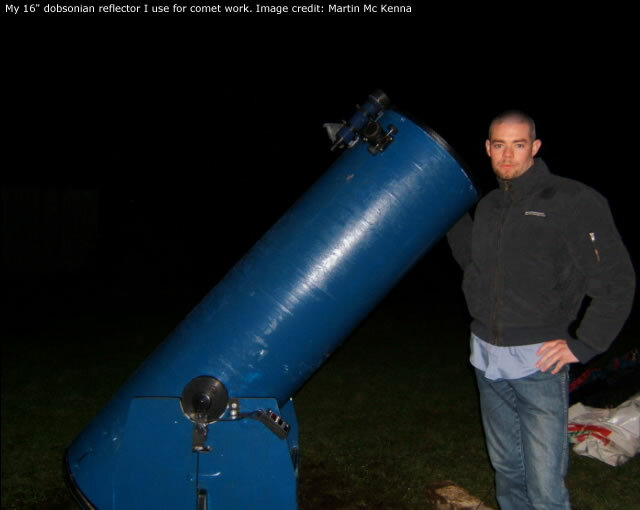 In January I was awarded 'Irish Astronomer Of The Year 2005' by the Irish Federation Of Astronomical Societies. In May 2006 I had the great honor of having asteroid 42531 McKenna named in my honor. Why not check out my youtube page and view some of my videos. I currently making a living as a professional photographer selling images and video footage. I enjoy writing educational articles based on the field of observational astronomy and intend to continue this trend. Currently I write popular articles for the local newspapers, web sites, and popularize astronomy and the night sky through various live and recorded radio interviews. My true passion is the night sky, were I will continue to pursue my dream of discovering a new comet..watch this space! I have always wanted to have my own web site and it has been in my mind for some time, however during the summer I decided that I would stop thinking about it and just do it. Having my own web site is fun, and of course it provides one with the freedom to submit or say what he or she wants, however for me it's much more than that. I love astronomy and the night sky however the general idea behind the site is to convey my passion for the stars to others and share it openly and honestly with everyone. If I can achieve this goal and perhaps even encourage someone else to begin their own journey in astronomy then I will be more than delighted. The site as it stands is but a mear template, however I intend to update this site with images, observing reports, and articles on a regular basis in the hope that it will become much more than a place for someone's snapshots of the night sky, my aim is that nightskyhunter.com will grow and mature into a resource for the amateur astronomer! Reading - Astronomy, science and meteorological related literature, self development books by Paul Mc Kenna, Anthony Robbins, Brian Tracy and Wayne Dyer. I'm also a big fan of Shaun Hutson, Andy Mc Nab, Chris Ryan and Ian Fleming books. Films - Horror, action and Hong Kong action films. I'm a big Jackie Chan and John Woo fan! Music interests - Nick Cave & The Bad Seeds, Johnny Cash, film sound tracks and general 80's music. Do not forget to contact me with your thoughts and suggestions.